Escorpion was announced, but Okumura replaced him on Monday. Tecnicos took 1/3. Titan submitted Taichi. Less than five minutes. Ephesto put him in a hold and the referee ruled Cometa submitted, though Cometa argued he did not. 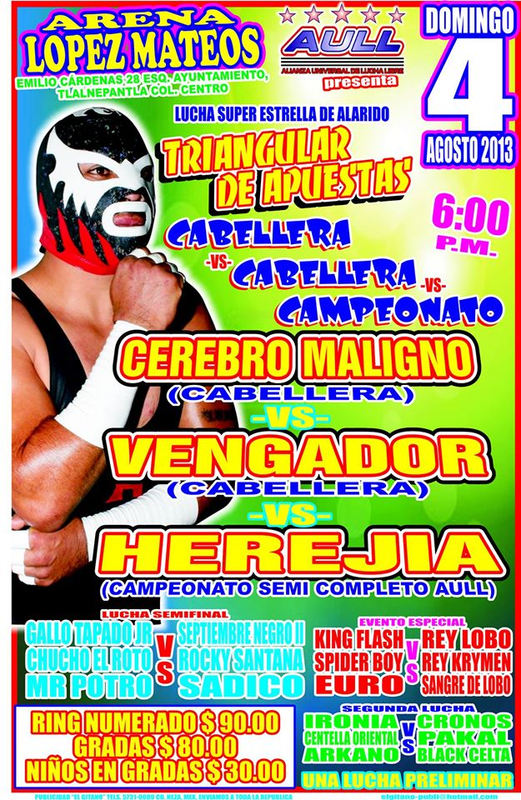 Thunder was originally announced, then replaced by Diamante Azul late Monday in the second card shift. Rudos took 1/3. Ultimo Guerrero was eliminated in the third, but snuck back in while Atlantis had GG in the Atlantida and pulled a switch for the win. 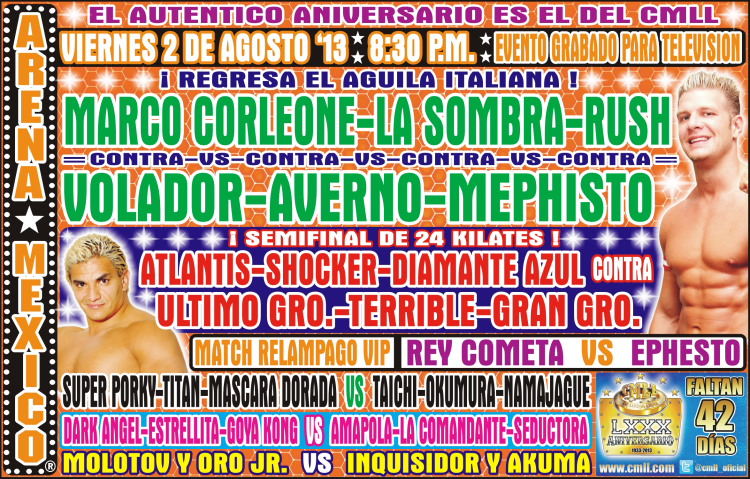 Marco (back from injury) and Rush replaced La Sombra (injury) and La Mascara Monday afternoon, then Sombra was put back in for Azul (and Azul moved down to the semimain) on Monday night. Straight falls, rudos DQed for excessive violence in the first. 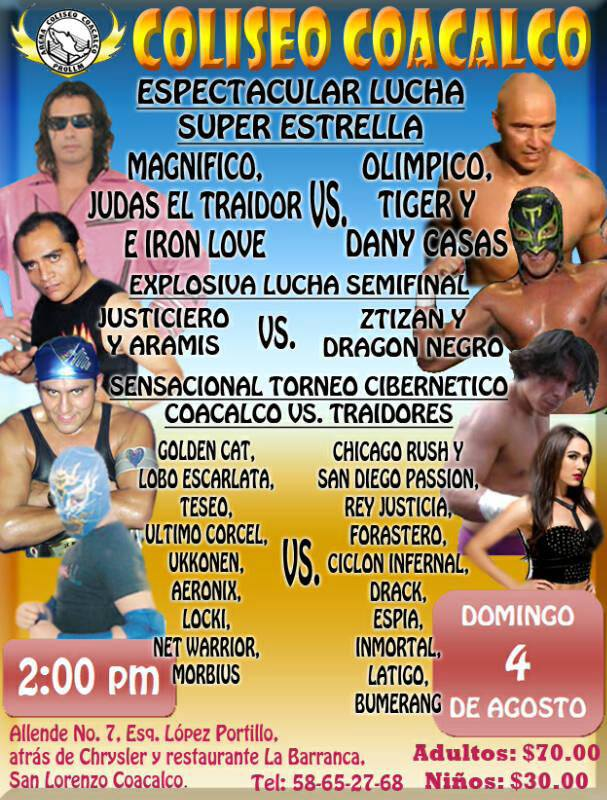 Volador fouled Sombra, Sombra pulled Volador's mask, referee DQed Volador. Moved to the opener. Pain & Carta got the pins. Moved to the segunda. Faby submitted Mamba. Cuervo (who had been watching the mach) ran in post match and stole a kiss from Faby, who was not happy about it. Scoria fouled Toscano for the DQ. Secta beat up Mirreyes after the match. Lider did a double stomp off the first barricade to put Psicosis in a table. Psicosis wrestled unmasked. Mexican Powers kept the titles in the first defense. Heavy Metal replaced Fenix, who appeared on the show to explain he was hurt. Seconds were Daga and Cuervo. La Secta and Perros del Mal (including Eita) all got involved and Cibernetico got the win this time. La Secta declared they no longer wanted to be followers, attacking Cibernetico. Perro Jr. tried to make the save, but the Secta took out him and his men. Joe Lider ran in, but was thrown thru a table. Faby Apache ran out and was attacked. Jack Evans, Heavy Metal and (maybe?) Mesias were finally able to run off La Secta. Event Notes: Joaquin Roldan got a surprise birthday cake after the semimain. No angle. 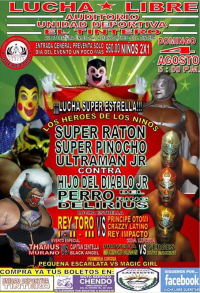 1) El Divino, Meteoro, Silver Slam b Mini Maniaco, Mr. T, Rey Aguila. match not listed in the results but AULL team is pictured as participating. Terry 2000 was a replacement for an injured Rocky Santana. ATM team not named in results. "Pantera Revolucionarios" defeat team AAA. Team XMW (still) defeat team DTU. Peligro said to be returning from a year long injury. Prior to the match, Trio Fantasia appeared and challenged the winners to take a shot at their WWA trios titles. Panteras defeat ATM in an upset. Rocky Santana turned out not to be hurt and was added to the cage match. 10 minute period before escapes. Order of escape went Tony, Leon, Monster, Loco, Zumbido, Murder, Rocky, Angel, and Psycho beat Ovett to win. 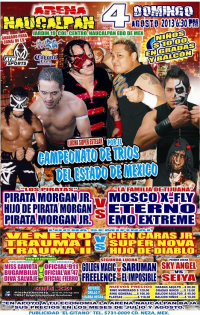 4) Dr. Salvaje, Fishma Jr., New Fire Jr. vs Granda Man, Máscara Sagrada Jr., Murcy Jr.
No finihs mentioned, but New Fire and Murcy Jr. are building a mask vs hair match. 5) La Máscara, La Sombra, Místico b Averno, Mr. Águila, Volador Jr.
Rudos took 1/3, Virus pulling Fantasma's mask and beating him. Feed went out during third fall, good from what we saw. Rudos took Fantasma and Delta's masks after the match. Rematch from last week. Very good lightning match. 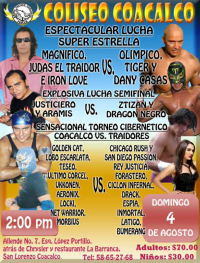 Puma got Oro in the mecedora, Angel de Oro reversed it to his own mecedora and then submitted Puma with a campana. Rush used Chris Benoit's last WWE theme as his music. 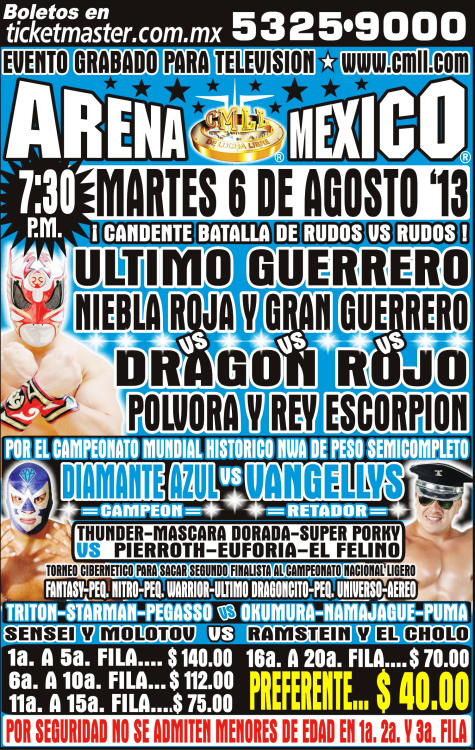 Rudos took 1/3, Terrible & Vangelis pinning Titan & Mascara. Rudos pre-match promo suggested a challenge for the national trios titles (with someone besides ineligible Taichi), though Mascara suggested a title match between himself and Vangelis post match. Good comedy match. Tecnicos took 2/3 with Marco/Thunder team spots. Hombre sin Miedo, Kendor Jr. & Sobredosis (Los Poderosos) attacked the Rockers after the match. Rockers attacked Poderosos after their win. Straight falls, rudos DQed in the second for shoving Tirantes. It took a while for anyone to realize the match was over - they kept fighting and the music didn't play for a couple minutes. Amapola won in 8:17 and challenged for a title match next week. Guerreros jumped the Revolucinarios. Revolucinarios took 2/3. Rey Escorpion took the mask off Ultimo Guerrero and pinned him. 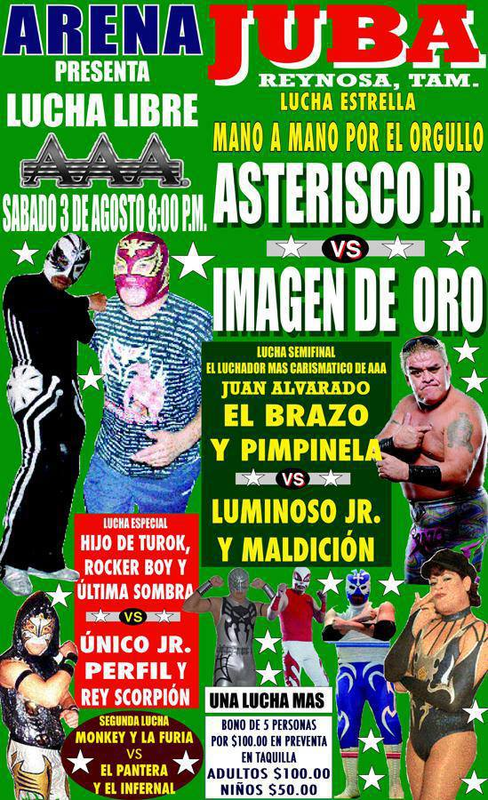 Mistico was waiting on the ramp to fight Averno, but Averno snuck around, still attacked him from behind, and took the first fall. 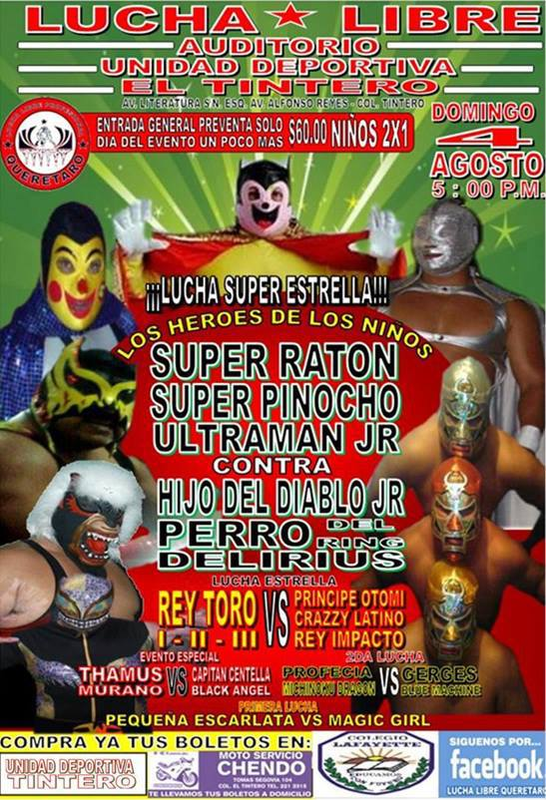 Mistico wont he second with a torito and the third with La Mistica. Said to be great match. 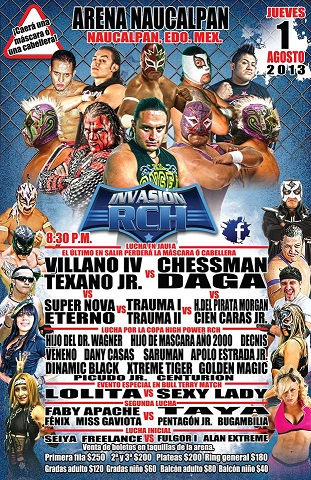 First time back for these two teams; they faced a lot in the last couple years (back when not-yet-Fenix and not-yet-Pentagon Jr. were part of the trios; Ares & Pantera are in their spots.) Not sure I've got the correct Pantera. Money thrown in. 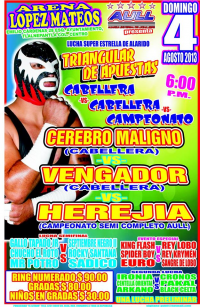 Rudos took 1/3, Niebla unmasking Sombra and pinning him. Vaquerita replaced Tiffany. Tecnicas took 2/3. Rudos took 1/3, Terrible beating Shocker. 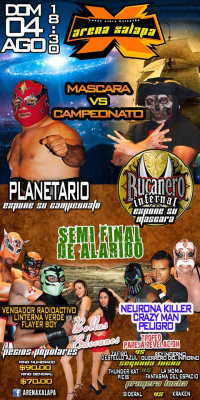 Rudos took 2/3, Mephisto beating Mascara and asking for a title shot next week. Rudos took 2/3. Cadetes del Espacio are 0-2! Okumura brainbuster Triton. 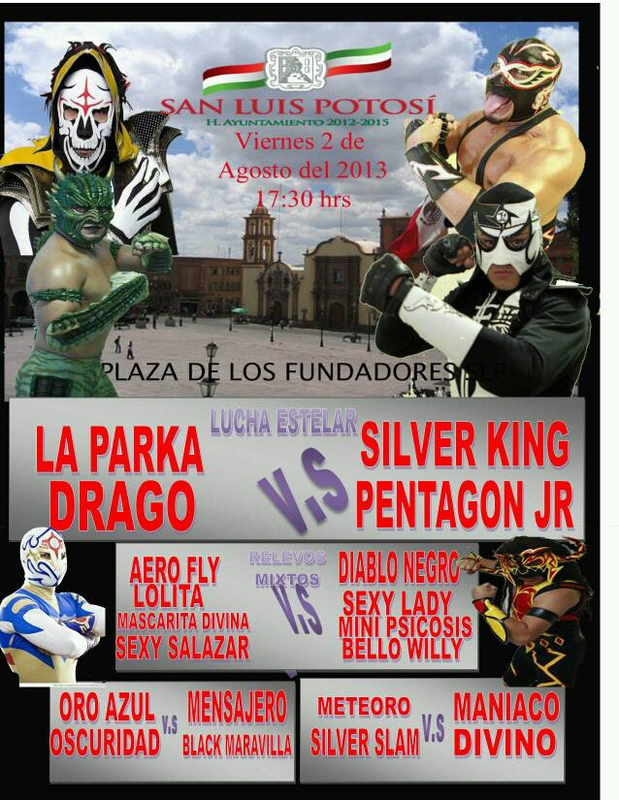 Elimination order not listed, except for Pequeno Universo being first out and Ultimo Dragoncito being the last on. 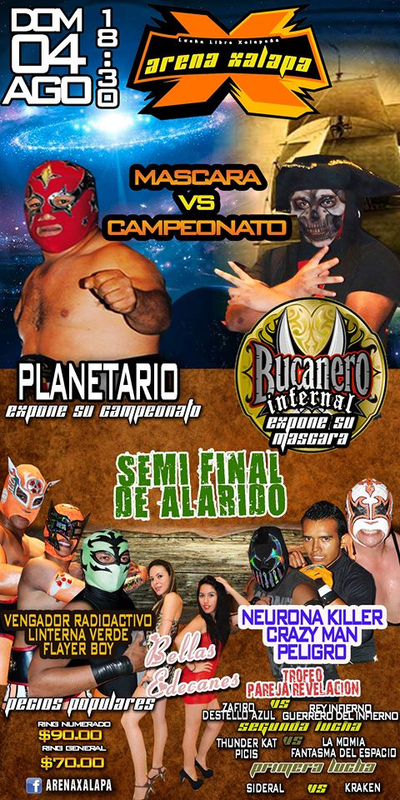 Pequeno Nitro won, will face Electrico next week for the vacant title. Tecnicos took 2/3. Dorada beat Euforia with craziness. Azul took falls 2/3. 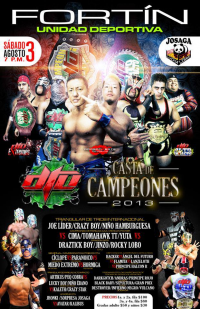 Diamante Azul came in as champion. 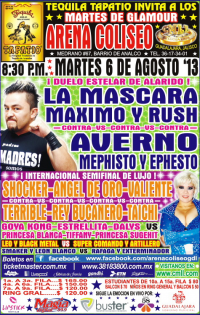 Seconds were Mascara Dorada & Namajague. Azul german suplexed in the third to keep his title. Second defense. Straight falls. Rey Escorpion pulled Ultimo Guerrero's mask and pinned him for the win.